The Dark: The Karsta family (Weavers) and Garva family (Tanners) visit this spot frequently to care for the alder trees and harvest their parts to make dye. Can be used to make red-orange, black, and yellow dyes for cloth and leather, and a bright flame-red hair dye favored by the young men and women of the valley. The trail: half a mile long, up the mountain, moderate climb, ends at large flat area of pinkish stone, 50' in diameter with clear views of the Horned Mountain Region. The Dark: Looking through the hole at sunset will reveal a secret you seek three times in your life. The Dark: Numerous (2d10+5) Giant Spiders of varying (large) sizes live in The Crack. Function much like trapdoor spiders. Weave webs inside the crack but send fine runner threads into the valley throughout the area. When a runner thread is tripped the giant spider who owns it emerges rapidly (surprise DC 21). The spiders usually keep their territory in the valley evenly divided so tripping multiple lines will often only result in a single spider unless you run as fast as you can parallel to the crack. The crack is so full of webs, spider eggs and desiccated corpses that it will burn rapidly. This will however encourage every spider to emerge nearly simultaneously. The Dark: Known to people from the valley. This is the training area for the Gold Needles [PAGE]. Young men and women from the valley between the ages of 15 and 17, live here throughout much of each summer and fall. They are trained by the Gold Needles in running, hiking, climbing, wilderness survival skills, and all things archery. Everyone loves the ropes course and ziplines and a valley wide midsummer festival is thrown here every year. NOTE: The only "easy" way into this hex is by following a mountain path that begins in hex  next to the Gold Needle Lodge. If players insist on entering it through a different way, it will take them 1d4 days to find a usable trail through the rugged mountains here. The mountain path enters a deep canyon with sheer, 100' walls. The Sunburst of Rope and Bells is encountered just past the first bend in the canyon. The Dark: The Sunburst of Rope and Bells was constructed as a joint effort between the Clearwater and Whitefeather families (Shamans). The back of the hide sunburst is painted with the face of a male warrior with wild black hair and golden warpaint who appears to be screaming in rage. The hides generate a small amount of heat that can be felt when nearby. Many of the Gold Needles say this heat is the fury of the warrior, but it serves to prevent snow from accumulating on the construction. Large sheep horns (made by the Whitefeathers) are attached to the warrior side of the sunburst, and from the warrior side, the gourds that hang from the ropes have been cut to resemble eyes. If undead approach the sunburst from the warrior side and are seen by the gourd eyes all the horns will begin to sound, as if each were a large war horn. This sound is loud enough to be heard clearly at Gold Needle Lodge . The small crystal shards on the sunburst collect sunlight during the day and glow softly at night (or in the dark). The light emitted by these crystals functions like true sunlight, with a radius of about 5', but they only emit the amount of sunlight they absorb each day (e.g., if they are in the sun for 6 hours then they will emit sunlight in the dark for 6 hours). The only way to pass through the sunburst (without cutting) is by crawling or climbing through the openings made by the rope "web". Each of these openings is adorned with strings of circular ceramic bells (made by the Clearwaters) that, when disturbed, rings a twin strand of bells in Gold Needle Lodge. It is possible, but relatively difficult (Dexterity (Acrobatics) DC 17) to pass through an opening without sounding the bells. High ranking members of the Gold Needles and members of the Clearwater family know how to temporarily disable to bell alarm for silent passage. NOTE: Hex  and  are part of the Hidden Valley of Aspens [0804 and 0805]. This valley can only be entered easily by passing through The Valleys of the Damned and Restless Paths [0906 -> 0806 ->0905 -> 0904 -> 0804 -> 0805]. 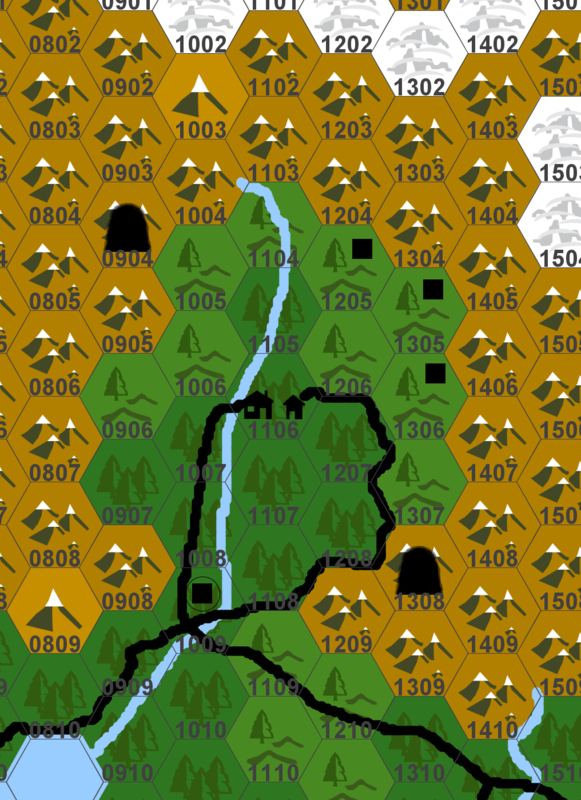 Attempting to enter this hex from another way may be possible, but will take an additional 1d4+4 days due to the rugged and mountainous terrain. Hidden Valley of Aspens - General Information - Ground rocky and uneven like crumpled paper. Tall aspen trees with white trunks and yellow leaves. Pale white flowers grow among the leave litter despite the coming cold and bright blue lightning bugs fly high up in the treetops every night. It feels peaceful here, except at the blighted points of interest, and sleeping in the valley confers [SOMESORTOFBONUSIDON'TKNOWYET]. The Dark: The black lines and curves form a pentagram nearly 500' in diameter. At each point of the star there is a ring of white fungus 4' in diameter. At the center of the pentagram is a twisted and ancient pine tree, with no needles, made of sparkling white stone and marbled with the black goop. This tree was once a gold pine like the one found in hex , before being corrupted and petrified by the necromancer Salmu Seru as part of his ritual to defeat the Goldmother (more info on [PAGE]). Anything touching the black goop will become stuck (Strength (Athletics) DC 20) and be slowly (1d6+2 days) sucked into the black line. With the right ritual, a powerful necromancer can command anything that was sucked into the pentagram to be "spat out" as a skeletal thrall that drips black goo. The Dark: This will be a dungeon. Quick 'n Dirty Notes: This is the ruined tower of Salmu Seru, Necromancer of the Garnet Eye and Blight of the Silk Fields of Noor. He grew this tower like a cancer from the mountain with black magics that can still be felt like lightning in the ears. He cursed the Valley of the Aspens and used its corruption to fight and trap the Goldmother. Imperfections in his ritual to trap the nature deity, vaporized him, and destroyed much of the tower. It remained empty for many years. A sorceress named Orana has recently moved in. She knows something powerful is trapped in Horned Mountain Valley, but does not know exactly what. She's heard of the Goldmother but it doesn't really mean anything to her. She spends much of her time trying to enter and research in Salmu's libraries in the tower's basement to find a way to corrupt this thing she can fell and make its power her own. Big Bad Evil Gal. More Info to come.